According to the authors, their study was undertaken because prior studies demonstrating risk to red meat consumption were flawed. Some had utilized populations that weren't representative of the average, while others didn't differentiate between unprocessed and processed meats, and where others still had covariates assessed at baseline only. Here the authors analyzed 28 and 22 years of data respectively (2.96 million person years) from the Nurses Health Study and the Healthy Professionals Follow Up Study involving 37,698 men and 83,644 women who were free of cardiovascular disease and cancer at baseline, and whose diets were assessed by 7 sequential (every 2-4 years) validated food frequency questionnaires. Given dietary recall difficulties, undoubtedly the questionnaires are from from perfect, however unlike the vast majority of other food/risk studies that utilize them (there's not a huge amount of choice but to do so), the data from the questionnaires here were adjusted using the correlation coefficients that separate and published validity analyses (here and here) of their own specific study population's food frequency questionnaires determined were required to at least try to account for their subjects' dietary recall inaccuracies. Further, they performed a whole bunch of beyond my pay scale statistics when exploring red meat specifically (eg "restricted cubic spline regressions with 4 knots"). When analyzing the data they discovered that men and women with higher intakes of red meat were less likely to be physically active and were more likely to be current smokers, to drink alcohol, to have a higher body mass index, to consume greater total amounts of calories and to have lower intakes of whole grains, fruits and vegetables, but even after controlling for all of those confounders, unprocessed and processed red meat consumption were found to be associated with an increased risk of total mortality, cardiovascular mortality and cancer mortality. So are you going to die if you eat red meat? Well you're going to die regardless of what you eat, but this study would suggest that you'll die ever so slightly younger if you eat red meat each and every day of the week, and even younger still if you eat processed red meat each and every day of the week. Did you catch the caveat of each and every day of the week? It certainly wasn't hidden in the study. So how much younger will you die? According to the study, eat unprocessed red meat daily and your risk of death will be 13% higher than if you don't. Eat processed meat daily and it'll be 20% higher. Those of course are relative risks. In absolute terms your risk of dying younger due to red or processed meat consumption doesn't amount to a huge number, nor do the study authors sensationalize their paper to suggest that it does. The media (and perhaps the study's press release - haven't seen it) did that. But that doesn't change the finding that this study did indeed determine there to be more risk associated to red meat consumption than other protein sources. As to what it is about red meat that's seems to confer risk? We don't know. Meta-analyses on saturated fat would suggest that ain't it, and that's good news for us butter lovers, but again, that doesn't change this study's findings. All in all this is a strong study in that there's an incredible wealth of data along with tremendous confounder controls and considerations. We'll never have perfect studies regarding foods and risks because we'll never randomize folks to long term diets differing in single variables and so studies like this one - long term, huge numbers, confounder controlled, thoughtfully considered - are the best we're going to get, and while I'm sure there are variables some axe grinders will wish were included, or analyses they'd love to have seen, to me at least it seems they included all the big ticket issues, and some smaller ticket ones for good measure. 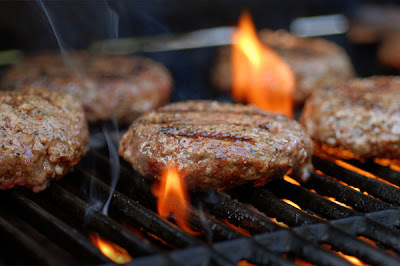 If there's criticism to be had it's in the study's reporting, where the distinction of eating red or processed meat daily is lost in the hype, and where the reporting leaves readers thinking they can never safely enjoy a burger, a steak or a hot dog. "A moderate consumption, for example one serving every other day, I think is fine." While the study's lead author An Pan told the LA Times whose headline ran, "All Red Meat is Bad For You" that he eats two servings of red meat a week. And this isn't really news. Basically the study's take home message is that proteins come in both healthy and unhealthy packaging. And that's where my Internet confusion comes in. Just as ridiculous as the all encompassing, "All Meat is Bad" chant that came from the mass media was the, "this study is terrible" chant of the Internet, a chant generally coming from those same people who will readily agree that there are less and more healthful carbohydrates (and fats). Seems to me a careful read of the paper would have perhaps toned down both the media's reporting and the Internet's rhetoric, whereas relying on press releases and newspaper reports, well that fuels misinformation, and apparently in this case, what comes off like frank anger. I adore red meat. I also adore processed red meat. But ultimately this study just adds more weight to what the bulk of the literature has already concluded - processed and unprocessed red meats aren't my best protein choices and if consumed daily, carry risks, albeit absolutely small ones, that other protein sources seemingly don't. Now maybe my read of the paper is off, and admittedly my stats days are long behind me so please feel free after actually reading the paper to weigh in if you think I've missed something, but for me, for now, yes, burgers are still on my menu this weekend (Mmmmmm, burgers), they're just not on it every day this week.